Jakarta, 26 December 2018 — What’s unique about the Balinese approach to sustainability and what can you learn from that? When the 2008 world financial crisis created in Wall Street was in full swing, a Balinese prince asked this question: “what kind of system allows one single person to defraud millions of fellow human beings by an unimaginable sum of US$ 65 billion?” He was referring to Bernard Madoff, a former chairman of the NASDAQ stock exchange, who was convicted of unprecedented crimes and jailed afterwards. Mindful of the anguish caused to people who lost their homes, savings, pensions and sanity, he went on “it therefore seems appropriate at this time to introduce the ancient Balinese cosmology of Tri Hita Karana." The Balinese prince’s name was Anak Agung Gde Agung. The son of the last monarch of Gianyar, Bali, he is a graduate of Harvard and Leiden universities, and has served in Indonesia’s cabinet as minister for social affairs from 1999 to 2004 under President Abdurrahman Wahid. Just a few years earlier, in 2005, Dr. Agung obtained a PhD from Leiden University for his dissertation Bali: Endangered Paradise? Tri Hita Karana and The Conservation of the Island’s Biocultural Diversity." After successfully defending his thesis, Dr. Agung was given several remarkable honors. He received congratulations from Queen Beatrix of the Netherlands, and the then Crown Prince Willem-Alexander came to his hotel to personally convey appreciation for his work. The University of Leiden, the oldest in the Netherlands, established in 1575, then accorded Dr. Agung the honor of signing his name on a 450-year old wall in its academic building. He became the first Asian leader to do so, following global luminaries Albert Einstein, Winston Churchill, and Nelson Mandela. An influential man with a message for which the time had come to spread it far and wide. Now we fast forward to 2018. A decade after Dr. Agung asked his incisive and critical questions in an interview with the Jakarta Post about the kind of system that could cause so much suffering during the world financial crisis, world leaders came to Bali for the World Bank and IMF annual meetings, where they attended a specially convened Tri Hita Karana Forum on Sustainable Development. The theme was how Blended Finance and Innovation could support the 2030 Sustainable Development Goals (SDG) of the United Nations. The local Balinese organizing partner Unity in Diversity contributed a remarkable diagram, showing the 17 SDGs not in the usual circle, but in a pyramid, based on how they contributed to Tri Hita Karana (the three sources of happiness or prosperity), viz. Spiritual, Ecological, and Human. With that unique way of presentation, it seemed as if Dr. Agung’s wish had come true, for Bali to share its unique cosmology with the world as a way to contribute to solving global and local problems. So what is this Balinese philosophy all about, and what can you learn from it? The usual translation of Tri Hita Karana is Three Sources of Happiness. It is shown as a Trinity, and it represents what can be described as the ultimate quest at the center of the life of all Balinese people, individually and collectively. In Bali, these three connections are called Parahyangan (spiritual), Pawongan (community), and Palemahan (environment). Tri Hita Karana asserts that you will experience happiness when you create and maintain a harmonious connection (relationship) with all three dimensions. Even if just one of your three connections is not working well for you, this will impact significantly on your whole life. We all know one or more trinities that are central to religions and wisdom traditions around the world. When the concept of Sustainable Development was first introduced to the international community, it was also understood to be a trinity, of economic, social, and environmental development. It links your spiritual connection with the Creator to your connections to the environment around you, and to your community of people. The three dimensions are seen as interdependent and equally important: you only achieve happiness when all three connections are healthy. Now, I assume that you are already engaged in actions to adopt a sustainable lifestyle, to reduce CO2 emissions and waste, and to help improve the environment in other ways. Am I right? And you might not be surprised that your happiness and prosperity will increase when you have good relationships with many people, at home, at work, and in your communities. But what about bringing in your spiritual connection into the question? What do you think, and how do you feel, about that? Perhaps, this is the first time that you feel challenged by a philosophy that requires from you that you integrate your actions for spirituality, the environment, and your community, into one equation as it were! To better understand what you can learn from Tri Hita Karana, let’s double click on some detail of this cosmology. It holds that the Microcosmos (Bhuana Alit) that we live in as humans is a reflection of what happens in the Macrocosmos (Bhuana Agung). People don’t connect these two by choice. They are, already, inherently connected. You as human being are therefore not separated from the macrocosmos, and the macrocosmos is, in turn, not separate from you and the microcosmos you live in. In other words, you are connected to the Source of all life, in a powerful way. You just need to manage that relationship very well, as well as you manage the relationship to the environment and to people around you. It’s all one package, so to speak. For me, Parahyangan is a powerful way of articulating what we often refer to as Spirituality (the interior or unseen, aspect) and Religion (the exterior or seen aspect) of our connection with the Source, the Creator, the Universe, or the term that you use. Now, wherever you live in the world, I’m sure it looks quite different from what you see when you visit Bali, including its temples, dances, residential compounds, and religious ceremonies. If you have a chance to dive deeper into Balinese culture during your visit, you will discover how much time Balinese people are expected to devote to doing tasks in their community (the dimension of Pawongan), including the making of elaborate offerings for their countless religious ceremonies. When you learn even more about Bali, you will find out that, like anywhere else in the world, there are shortcomings in Balinese communities too, for example in how the rights of women are behind those of men, particularly when they want to divorce. Let’s keep a practical outlook, that Bali is different from where you live. However, what if you could apply and benefit from Tri Hita Karana where you live and work, in your situation, and especially when it comes to advancing sustainability? To help you explore that further, I summarized the principles of the Three Sources of Prosperity (as I like to call them) in the diagram below, based on the model that I often use in leadership training, that of living and working in your interconnected Personal, Social, and Observed Worlds. 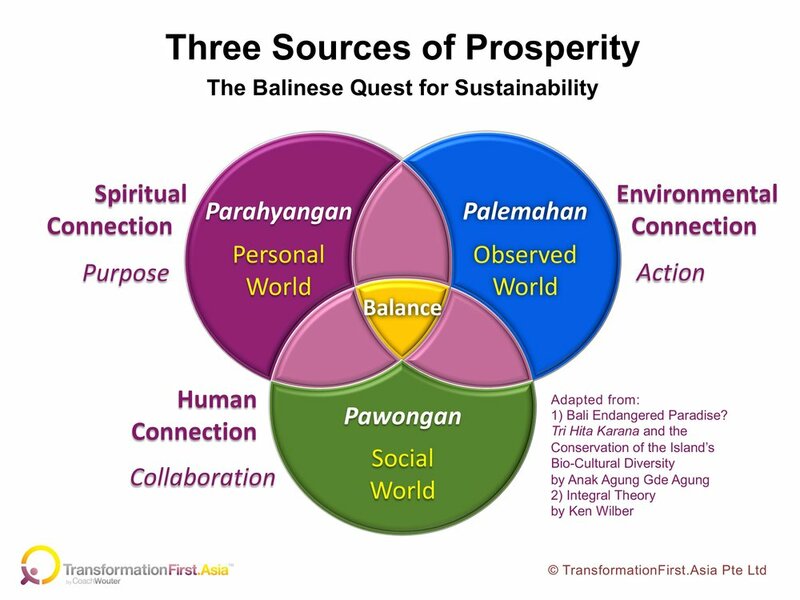 In this diagram, you see how the three essential connections of Parahyangan (Spiritual Connection), Pawongan (Human Connection), and Palemahan (Environmental Connection) correlate to, respectively, your Personal World, Social World, and Observed World. In italics, I added three keywords (Purpose, Collaboration, Action) to suggest how Millennial leaders, in particular, might interpret the importance of each of the three connections. How you interpret your Spiritual Connection will depend a lot on the worldview that you inhabit. If you express yourself primarily through the Purple, Red, or Blue worldview, you might express your spirituality through a particular religion or affiliation with a hierarchical organization with a strong code of practice. These colors refer to the body of knowledge that I share with leaders through the Work In All Colors training. If your worldview is world-centric at Orange, working hard to achieve the Sustainable Development Goals may resonate with your deep sense of purpose. If your worldview is mainly at Green, you might experience spirituality through deep relationships with other people. And for those who embrace a Yellow or Turquoise worldview, you might find that you are deeply moved by a life purpose (that answers your existential Why question), and that you are more flexible in how and where you can experience and express your spirituality. Discovering your life purpose might, for example, be related to one of the SDGs that you are passionate about. With these examples, my intention is to remind you that articulating your spirituality may be a key factor in how you can adapt Tri Hita Karana to enrich your own Life Quest. Your spirituality can take diverse forms depending on the worldview that helps you cope with your life conditions. We all start our life as a baby with a Purple worldview and then move sequentially into higher, expanded worldviews as we grow up and keep (un)learning. From the world financial crisis created in New York to the work of a Prince who re-articulated the ancient Balinese Quest of Tri Hita Karana and connected it with sustainability, and to a discussion among world leaders to explore how the international effort for the 2030 Sustainable Development Goals is supported by this ancient Balinese cosmology, we have made quite a journey. In my life and work as a leader and development professional, I have found a tremendous inspiration and challenge in applying Tri Hita Karana to become my Balinese Quest. I resonate deeply with the truth that my Spiritual Connection (which has always been deep and has become increasingly white-labeled), my Human Connection (focused on collaboration for positive change), and Environmental Connection (focused on advancing sustainability and healthy lifestyles) are the three Sources of Happiness and Prosperity for me in my life and work. What about you? I’m looking forward to hearing about your journey as a leader, and how you will use Tri Hita Karana to clarify and strengthen your Quest.